A Masternode is a server that has the specified cryptocurrency node (full blockchain). This node is synchronized and always connected with the cryptocurrency network. A masternode performs specific tasks related to transaction approving and propagation along the network. A Masternode is rewarded for these tasks. There is always a deposit required to start a masternode. This principle is called Proof of Stake (POS). Think of masternodes as a type of mining but without the power consumption needed for GPU rigs or ASIC devices. To get your masternode going, you should invest a significant amount of money, as well as configure the cryptocurrency node and server for it to operate flawlessly. 2Masternodes is the first fully automatic cryptocurrency masternodes hosting service. It allows you to buy entire masternodes or their shares. In just a few clicks, you can choose from a list of supported cryptocurrencies and become a masternode co-owner. You don’t pay for hosting. There are no hidden or extra payments involved. The process of masternode creation and synchronization is entirely automatic. 2Masternodes service is brought you by the creators of 2Miners cryptocurrency mining pools. 2Masternodes allows you to buy either a masternode share (create a masternode jointly, which is similar to pool mining) or an entire masternode. The service automatically configures the server, downloads and synchronizes the blockchain, and then pays out the rewards entitled to the masternode for its work, that is, to all masternode co-owners, depending on their invested assets percentage. The service fee is charged only when the masternode rewards arrive. The service fee is 10% for ZCoin, MNPCoin and Bitcoin Green masternodes, 20% for Bulwark, DeviantCoin, 30% for $PAC, 40% for GoByte masternodes. You need to have access to your wallet address to initiate the sale of your masternode share. You will receive your coins back in 3 days time for a full masternode and 2 weeks for a masternode share. Please note you will not receive any rewards after the exit process confirmation. How Secure is the 2Masternodes Service? The only data stored is your wallet address. No registration is needed. The process of the masternode generation is anonymous and transparent – all transactions are public, and you can easily monitor service operations using the blockchain explorer that provides information about cryptocurrency blocks. The critical parts of the system (such as the backend controlling incoming funds) have no external internet access at all and hidden in virtual private networks inside AWS. Constant monitoring for zero-day exploits to quickly address any potential problems. Access to mission-critical parts of the system is limited to a very few core team members. Parts exposed to public internet have no control over the funds or the masternodes controlled. Obviously, for security reasons, we are not going to disclose all of the security measures in effect, but rest assured, we have substantial experience in maintaining military-level security for internet resources. How to choose a masternode to invest in? ROI (Return On Investment). The more ROI is the more coins you get. However, ROI is not a constant value. The more masternodes there are in the cryptocurrency network the less ROI is. Coin Price. The price must be as stable as possible. Take into account Coin/BTC price chart. Coin Liquidity. It is important to be able to buy/sell the coin quickly without affecting the stability of its price. Have a look at the cryptocurrency exchanges where the coin is traded. Project and Developers. Active team with famous people involved in the project is the best option. Wallet. It is essential for a cryptocurrency to have a safe and robust wallet for your phone/desktop. We recommend you to do your own research on all the cryptocurrencies 2Masternodes provides and then take a decision. The complete masternode price is not so important as you could buy not only the full masternodes but also the masternode shares of any value (starting from 1% of a masternode price). How to buy a masternode share? By accessing and using 2Masternodes, you confirm that you have read and accepted the service Terms and Conditions. Click on the coin page. Click the “BUY SHARE” button. Read the warning message. Click “I understand” and send the investment to the service wallet. Please note that all the transactions are performed using the coins of the selected masternode. It is impossible to invest using Bitcoin or US Dollar. How to buy a full masternode? By accessing and using 2Masternodes, you confirm that you have read and accepted the service Terms and Conditions. Click on the coin page. Click the “BUY 100%” button. Read the warning message. Click “I understand” and send the investment to the service wallet. You could send an investment to start multiple masternodes in 1 transaction from the same address. Please note that all the transactions are performed using the coins of the selected masternode. It is impossible to invest using Bitcoin or US Dollar. 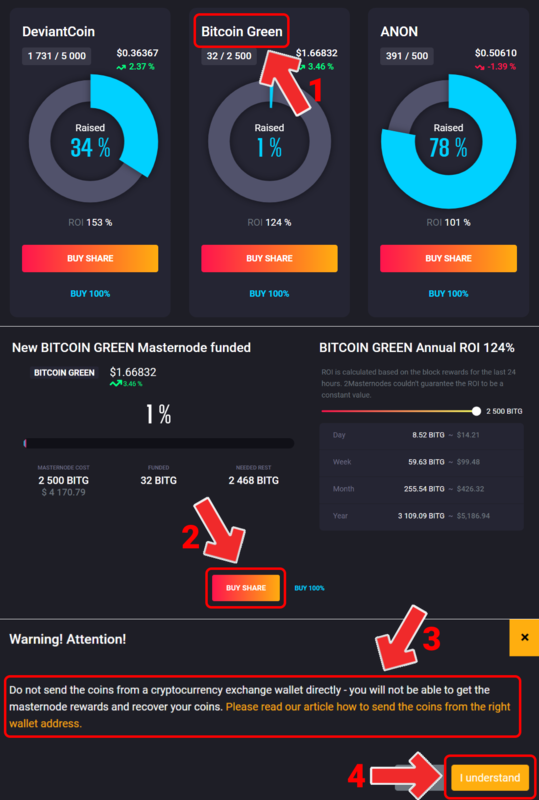 Bitcoin Green (BITG) masternode price is 2500 BITG. 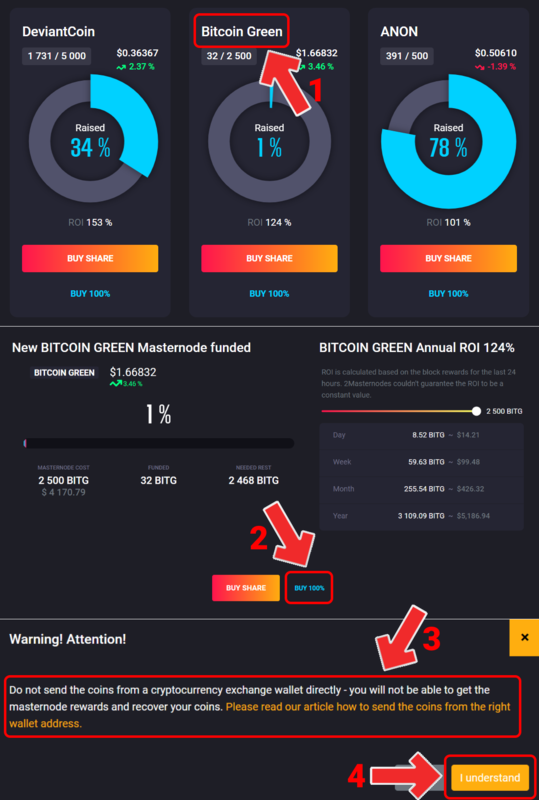 If you send 5500 BITG in 1 transaction, you get 2 full personal masternodes (2500 BITG each) and a share worth 500 BITG in the third masternode.